Contains 120 capsules for a 60 day supply. These 3 steps help your body not only create thyroid hormone but also allow that thyroid hormone to be active at the cellular level. 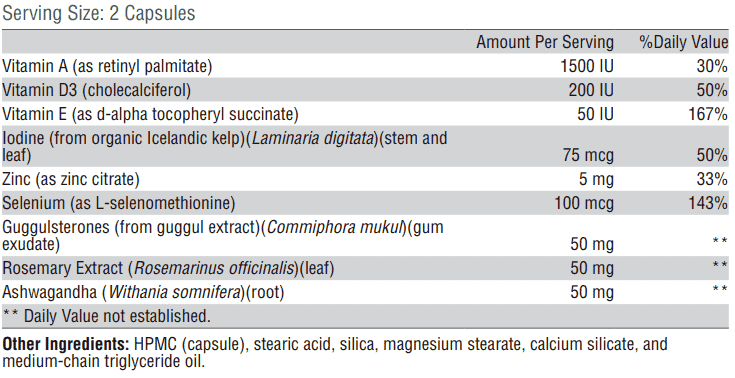 Due to nutrient deficiencies, poor diet, and soil depletion, many patients may end up with sub-optimal levels of these specific and unique ingredients. The replacement of these nutrients has been shown in clinical studies to help improve thyroid hormone levels if deficient (please see literary citations and studies below). In this setting taking supplements designed to increase free T3 levels may actually improve thyroid function overall. This can be accomplished by replacing nutrient deficiencies, by reducing inflammation and by promoting thyroid hormone biosynthesis. 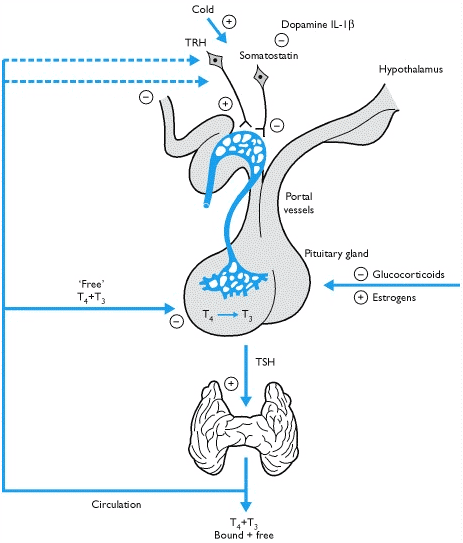 You probably know about T4 and TSH but do you know about T3 and reverse T3? When it comes to thyroid function ALL of these measures are important and helpful in correctly diagnosing thyroid dysfunction in the body. T4 and TSH are routinely tested by physicians but T3 and Reverse T3 may not be tested unless specifically asked for. As you can see, your T3 and reverse T3 levels give you information about peripheral conversion in your body. T3 Conversion Booster contains ingredients, nutrients, and supplements specifically involved in the conversion process of T4 the inactive thyroid hormone to T3 the active thyroid hormone. Increasing T4 to T3 conversion will also help reduce reverse T3 levels and may help thyroid status in your overall body. Understanding this basic physiology is critical because it allows you to take your health into your own hands and do what you can to help increase thyroid function beyond simply taking thyroid hormone medication. Did you know that you can still have hypothyroid or low thyroid symptoms even though you are taking thyroid hormone replacement medication? These symptoms may stem from an underlying problem known as low T3 syndrome. Low T3 syndrome may result in hypothyroid symptoms even though your TSH and free T4 levels may be relatively normal. T3 is the single most important thyroid hormone because it is THE active thyroid hormone in your body. How do you know if you have low T3? You can assess your T3 levels with serum laboratory tests such as Free T3, but you can also find low T3 levels through clinical assessment of your symptoms. The presence of these symptoms may indicate persistent thyroid dysfunction and should prompt further testing and evaluation for nutrient deficiencies involved in thyroid hormone conversion and production. T3 Conversion Booster contains specific ingredients that may help promote these important cellular pathways. Can T3 Conversion Booster be taken if you are taking thyroid medication? Yes, it was designed to be used both with thyroid hormone medication and without. The idea behind T3 Conversion Booster is to help naturally increase T4 to T3 conversion while naturally decreasing T4 to Reverse T3 conversion. One of the big problems with current thyroid hormone replacement therapy is that Doctors provide patients with T4 only thyroid medications such as Synthroid or Levothyroxine. Taking T4 only thyroid medications such as these is fine IF your body is capable of converting T4 to T3. Unfortunately, this is NOT the case for the majority of patients. 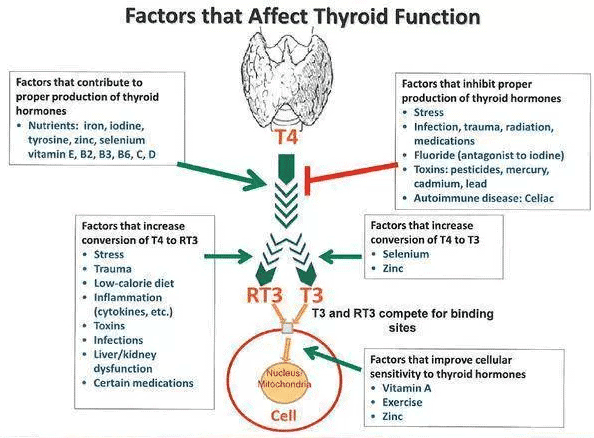 Factors such as stress, nutrient deficiencies, hormone imbalances, inflammation, chronic pain and depression all BLUNT the T4 to T3 conversion process and may make taking T4 only thyroid medication less effective. T3 Conversion Booster is designed to help this problem by reducing inflammation and providing your body with the nutrients required for thyroid hormone conversion and cellular sensitivity. T3 Conversion Booster can safely be taken in conjunction with thyroid hormone replacement therapy but we recommend that you use this supplement 30-60 minutes after taking your thyroid hormone. While it is unlikely that T3 conversion Booster will negatively impact thyroid hormone absorption, we still recommend that these supplements be spaced apart. The recommended dose of TCB is 2 capsules each day. T3 Conversion Booster is specifically designed to contain ingredients that help boost thyroid conversion. This unique blend of ingredients helps the body increase the natural T4 to T3 conversion process by providing the necessary nutrients for this process and by helping to reduce inflammation which can act to reduce this process. In addition to boosting T4 to T3 conversion, your body must also be able to adequately utilize thyroid hormone at the cellular level. Several nutrients have been identified to be involved in this process and these ingredients are included in T3 conversion booster. Iodine –> Iodine creates the backbone of thyroid hormone and is required in optimal amounts for proper thyroid hormone production. Low iodine may result in reduced thyroid function and hypothyroidism. Regulatory bodies recommend 150mcg of iodine daily for non-pregnant and non-lactating women and up to 220 to 290mcg per day for pregnant and lactating women while the average American daily consumption of iodine is estimated to be around 130mg per day. This creates up to a 20mcg to 90mcg deficiency in iodine per day in individuals unless they are actively consuming iodine-rich foods. Vitamin D3 –> Patients with low thyroid function and more likely to have low levels of Vitamin D. In addition, the severity of hypothyroidism tracks closely with the degree of Vitamin D deficiency. Vitamin D also plays an important role in immune function and low levels increase the risk of developing an autoimmune disease such as Hashimoto’s thyroiditis. Vitamin E –> Vitamin E helps protect the integrity of your cell membranes and acts as a powerful anti-oxidants which may indirectly help improve thyroid function. 1.) Can T3 Conversion Booster be Taken with Thyroid Medications like Synthroid, Levothyroxine, NDT, and Cytomel? Yes! All of our supplements can be taken with all thyroid medications and can be combined with all of our supplements. We recommend that you take our supplements at least 30-60 minutes away from your thyroid medication though to prevent absorption issues. 2.) Will using this Supplement Cause my T3 Levels to be too High? No! T3 conversion booster is designed to help promote thyroid conversion but it does not contain the active T3 thyroid hormone. It works by helping to eliminate issues which may be preventing your body from working at 100%. This means that it can be taken with medications which contain T3. 3.) How do you take T3 Conversion Booster? If using to improve thyroid function it is recommended that you take 2 capsules each day by mouth at least 30 to 60 minutes after your thyroid because but before noon. At 2 capsules each day this supplement will provide a 60 day supply. Some people may benefit from taking 2 capsules in the morning and 2 capsules in the afternoon/evening, especially for those with high reverse T3 levels or very low T3 levels. We recommend that you start with 2 capsules per day and adjust your dose as necessary. 4.) How long should I take T3 Conversion booster? We recommend that you use T3 Conversion Booster for at least 3-6 months for best results but it can safely be continued indefinitely without any issues. 5.) Are there side effects when using this supplement? T3 conversion booster is a supplement (not a medication) which means that it is generally very well tolerated and has minimal side effects. 6.) Does this product contain inactive fillers or binders? Is it gluten-free? T3 Conversion Booster does NOT contain wheat, gluten, yeast, soy protein, dairy products, fish, shellfish, peanuts, tree nuts, egg, artificial colors, artificial sweeteners, or artificial preservatives. 7.) Is Iodine safe to take in this supplement if I have Hashimoto’s or Thyroid disease? Yes! Especially if Iodine is combined with Selenium which helps the body produce thyroid hormone and protect against damage. Iodine is required for optimal thyroid hormone production and your body needs on average about 150mcg of Iodine per day. Normally you get this iodine from iodinated products like salt or from seaweed, but healthy individuals tend to get salt products such as Himalayan pink salt or Celtic sea salt which may not contain iodine at all. In addition, it is rare that people from the US eat enough seaweed each week to get their daily amount of Iodine. As a result, many patients may suffer from suboptimal iodine levels. Each serving of T3 Conversion Booster contains 75mcg of Iodine which also comes with Selenium which has been shown in studies to prevent the negative effects of Iodine by itself. With any product that contains Iodine, it is best if you start slow and increase your dose as tolerated. I had half my thyroid removed due to papillary thyroid cancer. No one really prepared me for the way I would feel afterwards. I was extremely hormonal, moody, angry, fatigued and difficult to live with. I felt absolutely miserable. I searched for supplements to help how I was feeling. Some would help a little but not enough & would make me feel jittery. I decided to try the T3 Conversion Booster. The website says to give it at least 2 months because everyone reacts differently. Well, it took almost 1 month and I do feel calmer. My family has noticed and things are definitely more peaceful. I am going to have blood tests done in a couple weeks and can't wait to see how my thyroid numbers are. I’ve been taking the T-3 Conversion booster for about a month and I wish I could report that I feel great and have more energy, however, I really can’t tell any difference in how I feel. I was hoping for even a slight improvement. I recently had my labs done again to see if I needed to change up my meds (I take a compounded T-3/T-4) along with LDN and my Dr told me to stay on same dose, even though I have had low energy and motivation since January. Perhaps it takes more than a month to feel improvement?